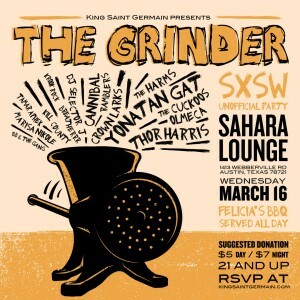 King Saint Germain & friends bring you “The Grinder” –a day and night throwdown — Noon to 2 a.m. at Sahara Lounge, Wednesday., March 16, 2016. The party features artists who are breakin’ waves, stealin’ hearts and pouring every ounce they have into their craft. Anchoring the show is the celebrated ​ Yonatan Gat ​ (trio) delivering fierce instrumentals that make crowds yell for more while they’re still playing. Austin hero ​ Thor Harris ​ (of ‘Swans’) and his ensemble woo the crowd with their esoteric marimba melodies. Ten other artists grace the two-part showcase traversing miles of styles. spoonfuls will take us through classic Jamaica & beyond. ​ Olmeca ​entertains with smart cross-woven rhymes, like “The Browning of America”, but makes you forget you’re also learning. Crown Larks ​ (Chicago, IL) have been called fearless — their smart psych-rock free-jazz has brought attention from around the country including Village Voice & Stereogum. ​ Cannibal Ramblers ​ call their music “Deconstructive Delta Swamp Grand Mal Seizure”, hear them roar! Austinite ​ Thor Harris ​ and friends are sure to still the room with their cinematic percussive sounds. Headliner ​ Yonatan Gat ​ (trio) brings their one & only brand of explosive improvisation – effortlessly weaving free jazz, desert scales & effervescent melodies. Austin female trio ​ The Harms ​ try to make you jump with their fuzzy surf-garage and jangly guitar,​ ​ and the nightcap? Austin sensation,​ The Cuckoos ​ channel The Doors, yet own it, making everyone savor the magic. I read this article and found it very interesting, thought it might be something for you. The article is called KING SAINT GERMAIN presents “THE GRINDER” and is located at https://www.austincurrent.com/king-saint-germain-presents-the-grinder/.